I choose CORAL Magazine because the topics covered often are often discussed to a deeper level than with other cookie-cutter publications. Personally, detailed discussions of feeding, husbandry, breeding of reef inhabitants and advanced discussions into the science of reef aquaculture with the input of experts in the field are my favorite. 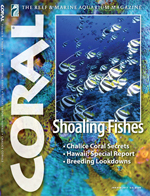 CORAL Magazine delivers excellent printed editions and amazing photography with up-to-date features making it a brilliant read and visual experience. I look forward to new editions, like kids waiting for Christmas. I love the information, the stories, just everything. Makes my day or days...pending free time. 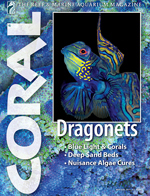 While originally and currently published in Germany as Koralle magazine, CORAL the English version stands as the only magazine exclusive to the marine aquarium hobby currently being offered here in the U.S. With that said, CORAL is a great magazine that I would encourage novice, advanced, and expert marine hobbyists alike to get and enjoy. 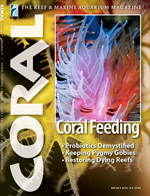 A better marine aquarium magazine doesn’t exist … literally. 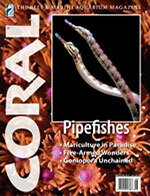 I read every issue of Coral Magazine from front to back, and this is one aquarium magazine that is a real keeper. Some of the articles can be a bit long, but the pictures are incredible and are printed on heavy paper. It's a magazine that everyone in the house has to browse. You are really doing the best reef magazine I’ve ever seen.